Vic Stewart’s 850 S. Broadway, (925) 943-5666. D daily; $$$. Reservations advised. Free valet parking. It’s hard to imagine a more romantic setting than dinner in one of the intimate refurbished dining cars at this premier steak house. 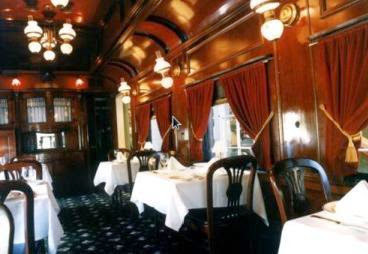 You can snuggle with your honey in your own private compartment of the authentic 1901 Pullman dining car, sipping a jumbo martini and anticipating what delicious item might arrive next time the door swings open. Perhaps it will be an appetizer platter laden with baked brie, sauteed wild mushrooms, and sizzling roasted garlic, followed by a serious steak (the top sirloin infused with Merlot is primo) and satisfying mashed redskin potatoes, and culminating with a decadent Chocolate Lover’s Pate to spread on cinnamon shortbread cookies. More seating is available on a former platform of this converted 1891 Southern Pacific train station. More things to do in Walnut Creek.